The Bank of Canada (BoC) is stuck in tough position, and I expect them to keep rates on hold for a considerable time. This is already discounted. However, there are interesting possibilities on a time frame longer than 18 months. A standard mode of thinking is that changes to the policy rate will have only incremental effects on economic growth; however I see that there are risks of a big discontinuity in how the Canadian economy would respond to hypothetical rate hikes. To start with the easiest part: the Target for the Overnight Rate is 1%, and I do not sees rate cuts on a reasonable forecast horizon. Instead, the only debate is when and by how much the policy rate will be hiked. My view is conditioned on the Fed outlook; if you think the Fed will hike before 2015, the Bank of Canada will follow suit. This is not just a question of the outlook for the global economy; instead my reading is that the BoC would prefer to hike rates earlier, but they are constrained by the inability to widen the short rate spread of Canada over the U.S. Using standard “output gap”-based reasoning, the current policy rate makes little sense. The bank expects the economy to close its output gap by mid-2015; hence the policy rate should be “normalised” by about then. Since inflation is forecast to be 2% then, the policy rate should be closer to 4% than 1% by mid-2015. This implies a bias to hike rates, soon. This recent speech by Governor Poloz was a not-very subtle signal of this: I counted 20 uses of variants of the words “natural” and “normal” in the description of the economy. This style of thinking led to Canada’s tentative hike campaign that started in June 2010, where the policy rate was hiked from 0.25% to eventually 1.0%. Using a single-good economy model, the worst thing that a too-early hike can cause is slightly slower growth, and so inflation will end up slightly below forecast. The reasoning is that the impact of changing policy rates will be a nice, smooth function, and so a small policy error will only have a small impact. However, I think that there is a significant risk of discontinuous behaviour in the Canadian economy; the problems associated with a multi-good economy are very present. As I discussed previously; Canada is currently in a “good equilibrium”, but it can move abruptly to a “bad equilibrium”. For simplicity, I will frame my discussion around the evolution of one economic variable: construction employment. 1. Imbalances Increases. 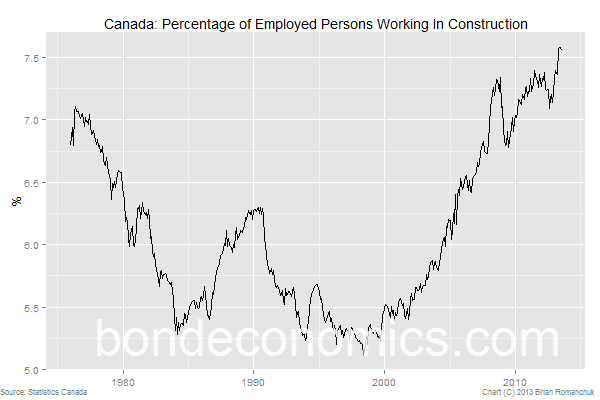 Construction (and related) employment remains at "too high" levels, which means that unsold condos will pile up even faster (plus empty shopping centres, etc.). 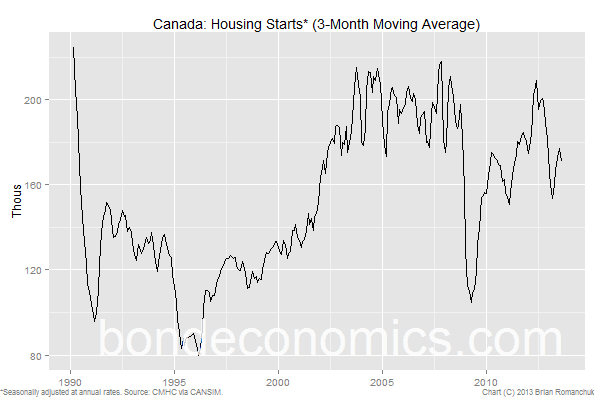 Even if one believes that Canada has not overbuilt housing units yet, it is clear that continuing to build units faster than household formation guarantees a big crash at some point. Canadian policymakers are using “macroprudential policy” (tightening loan rules, etc.) to prevent this outcome. 2. Catastrophe. Employment in Construction falls, and there are no other sectors that replace those jobs. Canada follows the U.S. path of massive job losses, as a downward spiral in demand wipes out the labour-intensive consumer-facing sectors (e.g., Restaurants, Retail, (Household) Finance). 3. Rebalancing. Employment in Construction falls, but other sectors step up to absorb workers. If there is a recession, it is localised and manageable. A bit of Austrian Creative Destruction ensues. Central bankers are not sensationalist bloggers, and operate under strict rules of behaviour with regard to their discussion of the economy. So it is no surprise that their implicit forecast is the gradual rebalancing scenario. (They do not make public forecasts about employment by sector, but they do discuss the components of GDP, and their central forecast appears to imply my scenario #3.) And in Governor’s Poloz speech, he argues that there are signs that the rebalancing scenario is the correct one. But a cynic would note: rebalancing has been the Bank’s forecast essentially since the end of the crisis, but since then the economy has become more unbalanced. To be fair to the Bank, the long sweep of history is on the side of a gradual rebalancing; panic is typically not a good policy. However, if we look at the highly similar U.S. economy we see that even with relatively steady growth, localised resource booms, and very high corporate profits, the economy is producing just enough jobs to keep up with population growth. There has been a structural slowing of job creation over the past decades. Why are Canadian management teams suddenly going to load up on workers at the same time that there is a demand headwind created by the unwinding of a construction bubble? Thus we return to the main topic: why I think the BoC cannot move too much more before the Fed. If the BoC hikes rates in an environment when the Fed is still trying to talk down the curve, investors will probably pile into the Canadian dollar. A spike in the Canadian dollar puts Canada’s exporters at risk, and import substitution will increase. However, these are exactly the sectors that need to expand to rebalance away from the over-extended “consumer facing” sectors. Therefore, the risk is that even a small move towards tightening could have a massive “cliff effect”: the housing sector cracks, and there are no sectors that will fill the hiring gap. I doubt that the Bank analyses the world in exactly this fashion. However, I suspect that their analysis of the sectoral growth patterns will cause them to be somewhat more cautious than usual, at least as long as inflation is well below the target. In conclusion: the Bank of Canada can only hike rates at about the same time as the Fed. If the slowdown seen in Housing Starts continues, it will weaken demand enough that rate hikes could be delayed even further.